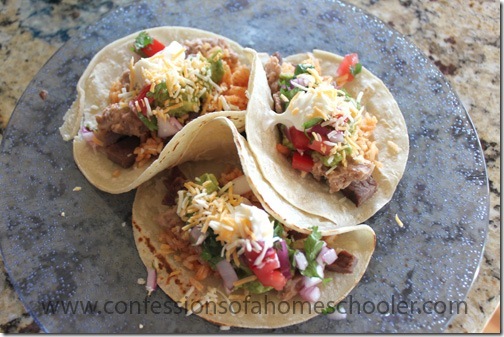 One of my absolute favorite meals in the world is tacos de carne asada! 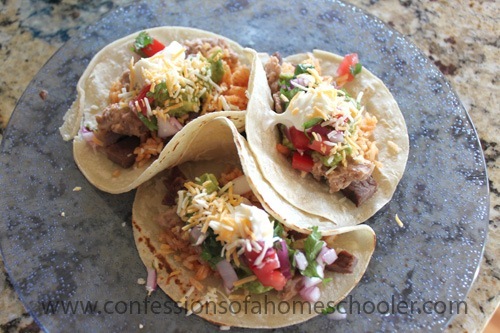 And since I’m a busy homeschooling mama I’ve found a quick way to make this delicious meal in a jiffy! Okay, it’s not exactly a jiffy, but still it’s pretty quick as far as meals go around here! So I admit that I cheat a little bit on this dinner, but don’t worry there’s no skimping on deliciousness! 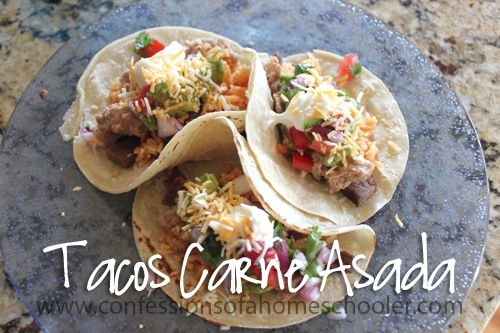 I like to use Costco carne asada (Here’s where the cheating comes in…) it already has a wonderful marinate on it saving lots of time. But if not, don’t worry I do have a marinade recipe below to help you get your carne asada goove on! Also please note, that I usually make my own Spanish rice and homemade refried beans to go with this dinner. The beans need to get started in the morning. But it’s super easy and cooks on its own all day, so not a big deal other than you have to remember to actually start the beans. Which can be difficult when you’re homeschooling. In which case you can resort to canned beans. Just set yourself a reminder on that fancy smart phone of yours and the world will be right. Carne Asada Mojo: If you don’t have a Costco to make your carne asada for you, this is another great recipe for the marinade. Just remember the meat will need to marinate at least an hour minimum. Mix all ingredients together well, and marinate the steak in your mixture for anywhere from 1-8 hours. Don’t go over 8 hours though or the meat fibers break down and your meat will get mushy. Refried Beans: In the morning I mince 4-5 garlic cloves into a crockpot. Then add in 1 small bag of dry pinto beans and cover them with water so water is about 1” above beans. No I don’t soak them overnight, but you can. I’m too lazy. Then I turn my crockpot on high and walk away until dinner time. I do check it here and there to make sure they’re still covered with water. If your water’s getting low, just add in a little more hot water to the pot. Once they’re nice and mushy, I remove as much water as I can with a ladle, but keep it in a bowl just incase I need to add some back in. Next I mash the beans with a potato masher until smooth. Then add in about 1 c. sour cream and shredded cheddar cheese and stir well. Salt to taste, I put in a lot of salt otherwise they’re really bland. If they’re still lumpy and you don’t like that you can use a hand mixer to smooth them out. Spanish Rice: If you’re adding Spanish Rice, so when it’s time to start dinner I get that started first. It takes about 20 minutes to cook. Here is a link to the recipe for my Spanish Rice. Carne Asada: Cook your carne asada on a hot grill turning regularly for about 10 minutes or until done. Let set for about 5-10 minutes then slice in thin strips across the grain. Tortillas: Warm up some corn or flour tortillas in a warm skillet for about 30-60 seconds on each side or until warm. I like to use the Costco raw tortillas, but you can use any you like. This is Strawberry Shortcakes job. She’s my tortilla flipper. Toppings: Prepare any additional toppings you would like. 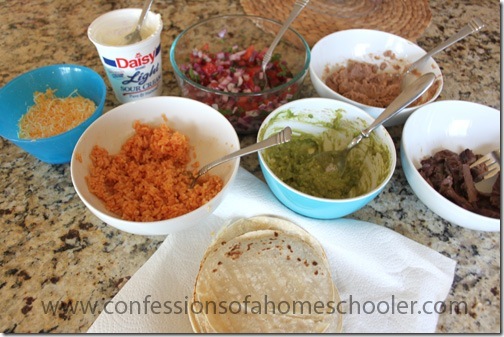 We usually add in fresh salsa, cheese, sour cream, guacamole, beans, and rice. For my guacamole I just mash up 1-2 avocados using a fork. Then I sprinkle it with some garlic salt and onion salt. Then add about 1 tablespoon of your favorite salsa and stir it up! If you’re feeling fancy you can sprinkle it with a bit of lime or lemon juice to help keep it nice and green, but I don’t always do that if I’m in a rush and feeling lazy! Serve: Serve all ingredients in self-serve bowls so folks can create their own delicious tacos and enjoy! From another busy homeschooling mom, thank you for posting this easy recipe! 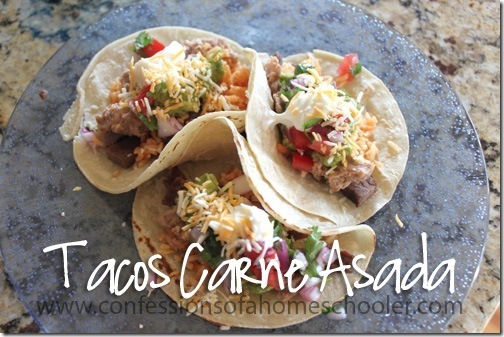 I’ve never made carne asada before and it looks delicious… Will try this with my family soon! Yummmmmmy! I so love making these on one of those days you forget to go to the store or to take something out to thaw.